I absolutely adore these fruits though it takes awfully long, about 3-4 months before it can ripen from the day it flowers. Knowing my craze for this fruit, my loving and generous hubby will often times sacrifice his share for this greedy me ;) and always guards the soon to-be-ripened fruits from the ‘preying eyes’ of the voracious starlings for my sake. Hmm…we didn’t win all and did loose some to them over the many years! My beloved always knows the best time to harvest the fruit, to obtain the perfect sweetness so that it’s served on the dining table the same day or the latest the next day! Plant type: Fruit tree, native to Tropical Americas. It is extensively cultivated in tropical and warmer subtropical regions worldwide. Light: Full sun to semi-shade, though prefers the former. Moisture: Requires medium to high water, but can moderately tolerate drought. Needs high humidity and sufficient rainfall. Soil: Adaptable to any kind of soil. It can be sandy or heavily loamed with good drainage. Propagation: Generally propagated from seeds that will produce fruit within 2-3 years. Germination may take 3-4 weeks though can be hastened by soaking the seeds for 3 days or by scarifying. Vegetative propagation by budding or grafting to Sugar Apple or other Annona rootstock is the other alternative, to yield superior varieties and promote early fruiting. 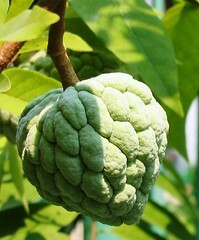 Features: Annona squamosa is a tropical, as well as subtropical fruit tree, reaching a height of 10-20 ft (3-6 m). A semi-deciduous tree that has an open crown habit of irregular chocolaty-brown branches and zigzag twigs, with alternate oblong-lanceolate leaves, 2-8 inches long and 0.75-2 inches wide. Leaves are thin, dull medium-green in color and aromatic when crushed. Tiny conical-like buds on dropping 1-inch stalks appear singly or in groups of 2-4 along branch tips, which will then half-bloom with 3 yellow-green petals that will dry and fall within 2-3 days to reveal tiny fruits. These will gradually mature and ripen in about 3-4 months. The ripened fruits are usually round, ovoid or conical, 2-4 inches in diameter, spotting knobby segments in shades of pale or bluish green, or greyish-green with creamy-yellow or orangy-yellow margins. Besides these skin shades, there are many other varieties of the species Annona squamosa, spotting deep pink to red or purplish-red skin, some even speckled and bear seedless fruits. Enclosed inside the ripened fruit which weighs about 100-400 grams, is a mass of soft, creamy-white and glistening, cone-like segmented flesh that is slightly fragrant and deliciously sweet and custardy. Within most of the segmented flesh is a single blackish-brown seed that is hard and shiny. 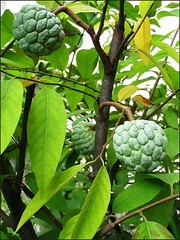 Usage: Sugar Apple is an excellent tub or container plant for indoors and patio, with an added bonus of being rewarded with edible fruits. High in calories with nutritional value, its fruit is usually eaten fresh out of hand (just savour the fabulous sweet flesh by the mouthful and spit out the inedible seeds). The thick juicy and creamy pulp, after being separated from the seeds can be used to make delicious milkshakes, ice-creams and sherbet. Besides, the Sugar Apple tree not only serves as a host for lac-excreting insects and caterpillars of some butterfly species, but even its seeds, leaves, bark and roots have many uses. Its seeds, though acrid and toxic, can be grounded into a paste and applied to hair to get rid of lice. However, it must be kept away from the eyes as it is highly irritant and can cause blindness. And, its leaves have medicinal uses – in India, the crushed leaves are sniffed to overcome hysteria and fainting spells, and leaf decoction is used for treatment of ulcer, wound, dysentery and other ailments. 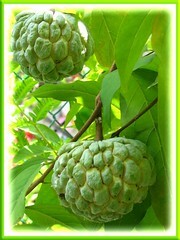 Care: Sugar Apple is relatively carefree. Being a tropical fruit tree, it’ll reward you handsomely if properly watered and provided with enough light, warmth and humidity, together with a monthly feed. After harvesting of fruits, prune back long branches and thin its center of unsightly twigs. Check occasionally for mealy bugs and caterpillars. For temperate zones: Hardiness – USDA Zone 10a, 10b and 11. Tree is cold and frost-sensitive, defoliate below 10 degrees C and killed by temperatures of a few degrees below freezing. More information here. var. 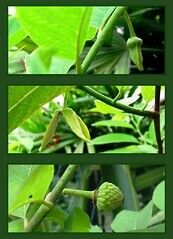 Thai-Lessard : dull green foliage and green-yellow petals, bluish-green rind. var. Kampong Mauve : red variety, purplish-red rind. var. Sangareddyiz : red-tinted foliage and flowers, deep-pink rind, mostly non-reducing sugars, insipid, with small, blackish-pink seeds; poor quality; comes true from seed. var. Red-speckled – having red spots on green rind. var. Crimson – having conspicuous red-toned foliage and flowers, deep-pink rind, pink flesh. var. Balangar – large, with green rind having rough, warty [tuberculate], fairly thick rind segments with creamy margins; sweet; high yielding. var. Kakarlapahad – very high yielding. var. Washington – acute tuberculate rind segments, orange-yellow margins; high yielding; late in season, 20 days after others. var. Barbados and British Guiana – having green rind, orange-yellow margins; high-yielding; late. var. 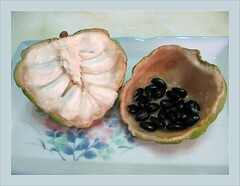 Beni Mazar – nearly round, large, 5 1/4 to 6 1/2 oz (150-180 g); 56-60% flesh; 15-30 seeds. var. Abd El Razik – light-green or reddish rind; nearly round, large, maximum 8 1/3 oz (236.3 g); 69.5% flesh; 14 seeds. 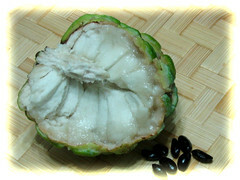 Read much more about Sugar Apple from the fact sheet of Purdue University, by Julia F. Morton. Incredible! Our last fruit for this season harvested today weighed 450gms…never before this big and heavy! So very sweet but unevenly ripened, probably one-fifth of fruit (the upper portion) unfit for consumption as unripe. This is the first time we’ve ever seen such an occurrence? Crescentia cujete (Calabash Tree) has multiple uses! 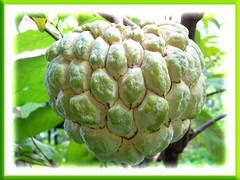 regarding extraction of the sugar apple should be disply….